Patterson Park is one of the oldest parks in Baltimore, spanning 300 years of the city’s spirited history. On Hampstead Hill, the ridge where the Pagoda now stands, Baltimoreans rallied on September 12, 1814 to protect the city from the threat of a British invasion. By water, British troops entered the Patapsco River and bombarded Fort McHenry. By land, they amassed forces at North Point. As they marched on to Baltimore and looked up to Hampstead Hill they saw Rodger’s Bastion – including 100 cannons and 20,000 troops. This sight led the British to return to their ships and leave the Port of Baltimore. With its historic significance and fine view of the harbor, the area became a popular place for citizens to stroll and picnic. In 1827, in an effort to re-create the public walks that he had seen in Europe, William Patterson offered the mayor of Baltimore six acres of his property. In 1850, the city purchased another 29 acres from Patterson’s heirs and on the evening of July 13, 1853, 20,000 citizens witnessed the park’s formal introduction as a public space. Eventually, the city purchased an additional 30 acres of land and began planning for park structures fashioned after those in Central Park. However, on the eve of the Civil War in 1861, all parks and open spaces were earmarked for troop occupation. Camp Washburn was established on Hampstead Hill and later a hospital – Camp Patterson Park – was set up. Once again, Hampstead Hill was a strategic military lookout and fortification. When the hospital was dismantled in 1864, the park was in deplorable condition. George A. Frederick was hired to build structural elements within the park, enhancing the park’s beauty by introducing the Victorian character that remains today. 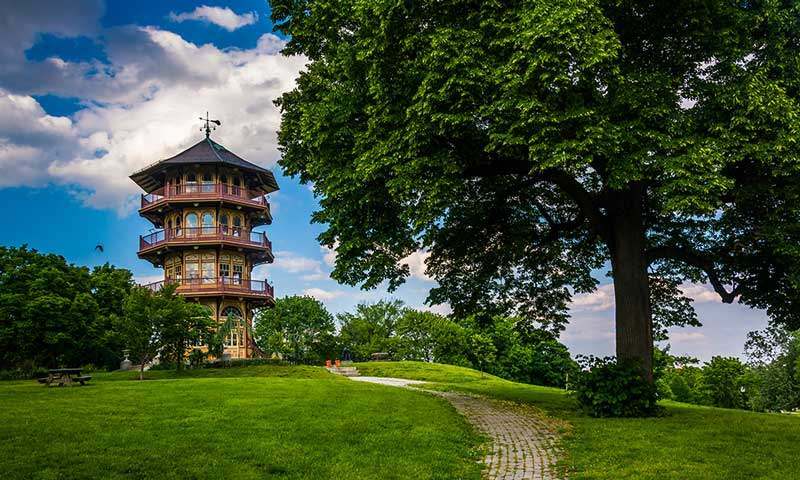 The Pagoda, originally known as the Observation Tower, was designed in 1890 by Charles H. Latrobe, then Superintendent of Parks. In 1905, Baltimore enlisted the help of the famous Olmsteds, who created plans for a recreational design for the eastern section of the park, believing that only through its use would the park remain healthy and vital. Public pools, sports fields, and playgrounds became more important to a growing urban population.